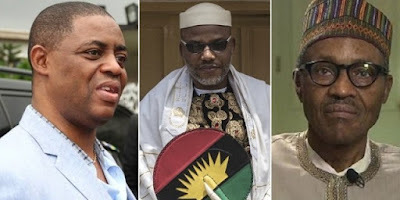 The former minister of aviation, Femi Fani-Kayode, has reacted to the reported Nnamdi Kanu house arrest after the Nigerian army reportedly surrounded his house in Umuahia, Abia state. Recall, Nnamdi Kanu’s lawyer, Ifeanyi Ejiofor had yesterday cried out to the public over concerns about the IPOB leader’s safety, claiming his client has been placed under house arrest by the Nigerian army. Now, the former minister, who took to his Facebook page condemned the action of president Muhammadu Buhari vowing to hold him responsible should anything happen to Kanu.. The behaviour of the military against a defenceless and unarmed civilian population in Abia state is reprehensible. We call on the international community to bear witness to what is unfolding in Nigeria and we will hold Buhari responsible and accountable in the event of any loss of life.